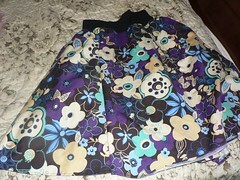 In need of clothes (oddly, the others in the closet seem to have shrank), I started sewing. I opted for quick, knit waist skirts. Two are half circles, two are just a-lines. Molly even made herself one of the apple skirts.